A great read, very encouraging and motivating, each chapter drew me in and kept me hooked. Inspiration in a small package and I am looking forward to the next read. There are times in our lives when we have to stop and think for whatever reason. Powordful Choices Powordful Lives explains that these stops are indeed a good time to take stock of things and access whether we are on our chosen path. It is a book we all can relate to and I particularly like that at the beginning of each chapter there is a phrase related to the chapter and at the end of the chapter another one to reinforce the message. Such as Chapter 5 named Staying in Your Lane, which rang true to me. It is related to focusing on a task/goal until you have achieved it. I quote "During your life's journey, you will need to have a constitution that is strong enough to weather a variety of storms." In other words no matter what the weather, stay focused on your goal. "Stay in your lane. The unfamiliar terrain today will become familiar terrain tomorrow when you are able to remain disciplined and focused." A highly user friendly book which is poignant today as we lead such busy lives. Brilliantly readable and important and useful stuff on building relationships and resilience. Firstly l must Thank You for leaving your book. It is truly inspiring and the simplicity in the way you have written and explained the whole concept of how to change ones life, through words in our thoughts and the POWORDFUL vibrations that it send a out to the universe is so succinctly explained. I have read many books like The Secret, The Power by Rhonda Byrne, Deepak Chopra, Iyanla Vanzgant, Irish Mountain Dreamer (The Invitation), Jacwualine Pratt (Inspirations for Women.... A Journey to Wholeness) Louie Hay to name but a few. But this was about YOUR Journey and it is a brilliant 1st book and I hope many more to come in the best future. I would definitely highly recommend this book. In fact I would like to buy two more copies for my daughters as a Christmas present. Well dear Olive, hearty congratulations on your successful launch. The Cover with the Eagle... a POWERFUL bird, strong and persevering; the colours are a combination of gentleness yet inviting and it draws the attention to the Reader. I had been looking forward to having a copy of this book but was never aware of the power of the author's words. As I opened the book, I stopped at the Acknowledgements and was touched. I read on to the Preface and found myself thinking 'wow' at almost every sentence. I already felt overwhelmed by the power of the book and the words on the pages, and I was not even at the first chapter yet. But, the best was yet to come. I read a sentence, I closed the book, I thought (deeply) then I began the process again. This continued until I had finished reading the whole book. Although a pocket sized, reader friendly book, it took twice as long to read as I found myself going through the 'read a sentence, close the book and think' process, after almost every sentence. I initially began to highlight certain parts of the book but found this a pointless exercise as this would have meant I would have to highlight the whole book. The style of writing spoke to the reader, personally and you could find parts of yourself in every paragraph. A truly remarkable writer. 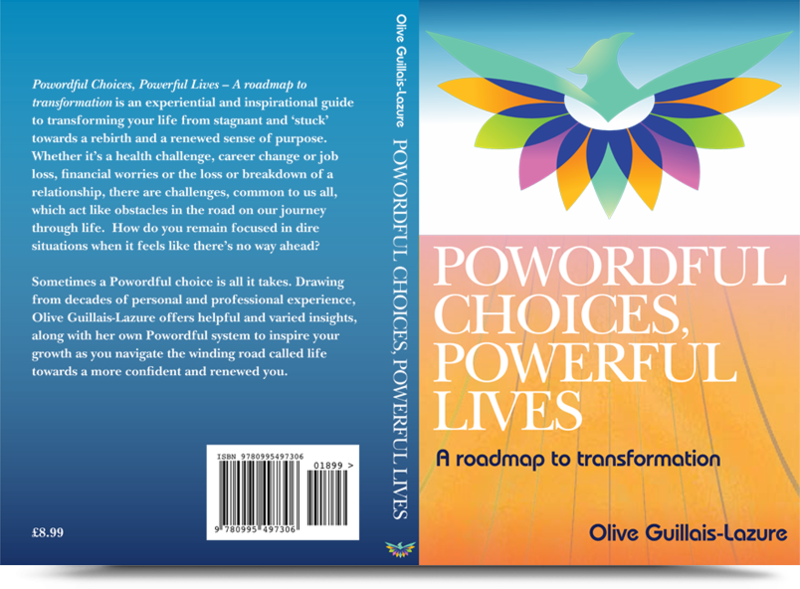 Powerdful Choices Powerful Lives is a fabulously, inspiring book which I am about to read again, and I am quite sure I will repeat again and again. As I travel around London quite a lot, I always need something to read. This book is not in my bookshelf, and I do not think it will get there as it has not left my handbag and travels with me on all my journeys. I do not know when I will put it down again. Powerdful. A most inspiring, easy to follow self-help book. Kept me interested right to the end. I have already started using some of Olive's phrases, and look forward eagerly to the next book! Congratulations on your 'momentous' day and the launch of your 1st book. Linda and I were totally inspired by the book, your talk and the whole event. well done and I look forward to the next book. Greetings Sister Olive, i did receive your book, and found it truely uplifting. Yes i read it all the very day it came, and reading it again. There was a part in your book that blew me away, as if you was talking about (myself). I have been arguing with myself, and asking alot of questions and the part i read was the answer ive was looking for. Your book is a guide in keeping yourself grounded, its encouraging, enlightening and I give thanks. I certainly will be spreading the word about your book and encouraging others to purchase one. Peace n blessings to you and yours.